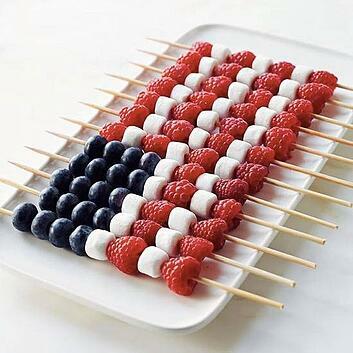 What better way to celebrate Independence Day than feeding family and friends with some fun flag foods? 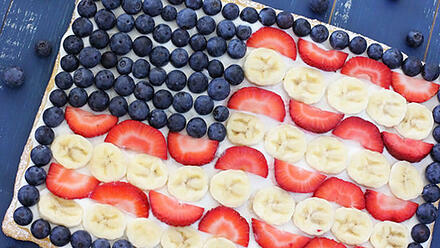 We’ve scouted out some berry patriotic fruit creations to wow your cookout crew this 4th of July. On a greased baking sheet, lay out the Crescent Seamless Dough Sheet to make a rectangle. (Gently shape the edges if need be, and push down the corners so that they do not flare up.) Bake for 15-20 minutes until cooked and lightly golden. Remove and let cool to room temperature. Dust lightly with powdered sugar if desired. Spread the yogurt on top of the dough sheet so that the entire pizza is covered, leaving a 1/2-inch border around the outside. Place the blueberries all around the outside to make a border, and then fill in the upper-right quadrant with a rectangle of blueberries. On a cutting board, slice the strawberries and bananas into thin coins, and halve them if needed so that they are about the same size. Layer the strawberries and bananas onto the pizza to make red and white stripes. Serve immediately or refrigerate for up to a few hours. Thread 4 blueberries, 2 mini-marshmallows or banana slices and 2 raspberries or strawberries on each of five 10-inch wooden sticks. On the remaining seven sticks, thread 4 raspberries or strawberries and 3 marshmallows or banana slices to create this all-American treat. Toast whole wheat bread slices. Spread peanut butter on each slice, covering top side fully. Place the blueberries in 3 even rows in the upper right corner. Halve the strawberry slices and line across top of bread. Place the halved banana slices in a row under the strawberries. Repeat until you reach the bottom of the bread and repeat on other slice. 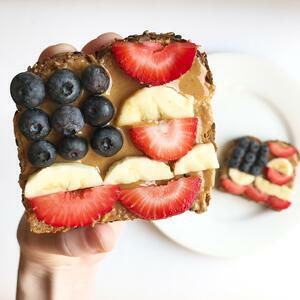 Have a healthy and happy 4th of July from all of us at O2 Fitness!